Two young sisters from Saudi Arabia who spent six months hiding in Hong Kong after fleeing their family have left for a third country after being given humanitarian visas, their lawyer says. Rawan and Reem (not their real names) said they did not want to return home because they feared punishment. The women said they were stopped by Saudi officials at Hong Kong's airport en route for Australia in September. No details about where they are and how they left have been released. "We are thrilled that our story has a happy ending and that we have found our way to safety to re-start our lives free of violence and oppression," the sisters said in a statement released by their lawyer. "We wish for our story to offer hope to others who face similar situations. We want to say loud and clear to the Saudi authorities and other regimes which treat women unequally: never underestimate the strength of brave women." They left Hong Kong late last week and were "safe and well," the statement added. The Saudi authorities have not commented on the case. Rawan, 18, and Reem, 20, arrived at Hong Kong's airport in September in a two-hour stop as they travelled to the Australian city of Melbourne. They had fled their family while on a holiday in Sri Lanka. But they were stopped from continuing on by Saudi officials who attempted to seize their travel documents, the sisters said. They then resisted boarding a flight to Dubai, only to find the flights to Melbourne they had booked had been cancelled. The women fled the airport and spent the following six months in Hong Kong hiding in 13 different places, including hotels, hostels and shelters, they told the BBC in an interview last month after launching an appeal for help. In November, they were informed that their Saudi passports had been invalidated - under Saudi law, women have to get a male relative's approval to apply for a passport or travel outside the country. 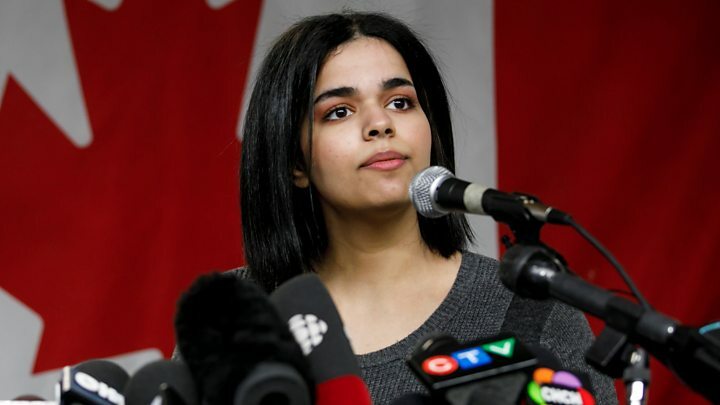 The sisters said they had hatched a plot to flee their family because they had "no dignity" in their lives in Saudi Arabia, where they were beaten, humiliated and forced to do household chores by their male relatives. The women said they had renounced Islam - punishable by death under Saudi law - and feared for their safety if they were forcibly returned. "They are now in that third country, beginning their lives as free young women, looking forward to assimilating into the local culture, contributing to their new home and leading lives as equal human beings," their lawyer Michael Vidler said. Reem told the BBC in February she had been studying English literature before escaping and that she had plans to write about their lives in Saudi Arabia. Rawan said she wanted to study biology and gain a PhD in genetics. Reacting to the news, Lynn Maalouf, Middle East Research Director at Amnesty International, said: "The sisters must be allowed to build their lives without living in fear that their family or the Saudi authorities will force them back." She added: "No woman or girl should fear for their life like Reem and Rawan did. Saudi Arabia must urgently reform the guardianship system and end the whole range of discriminatory laws and practices women face."